I planned this garden in February 2013, excavated in March, planted in April and May. 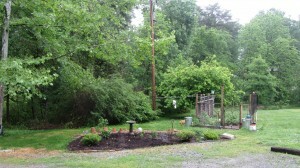 Designed to slow and hold water running down my steep driveway, the garden is about 10 x 25 feet. We cleared the site of trees and excavated a level-bottomed trough about 18 inches deep (I think of it as a bathtub designed to fill up to the top and drain slowly). After a soil test, the garden area was filled with 1/3 original topsoil, 1/3 mushroom soil (composted manure), and 1/3 wood mulch and amended with lime. (More photographs and information to follow). Piedmont Soil and Water Conservation District for funding and expert assistance. Posted by mary on Monday, August 19, 2013, at 4:53 am. Filed under Garden. Follow any responses to this post with its comments RSS feed. You can post a comment or trackback from your blog.